Life really takes the life outta you, ya know? Having just returned from Quilt Market I am awash with things that I want to post for you which is piled up on top of the stack of things I wanted to post for you before I left, and I am standing underneath, looking up at a very threatening pile of prettiness. 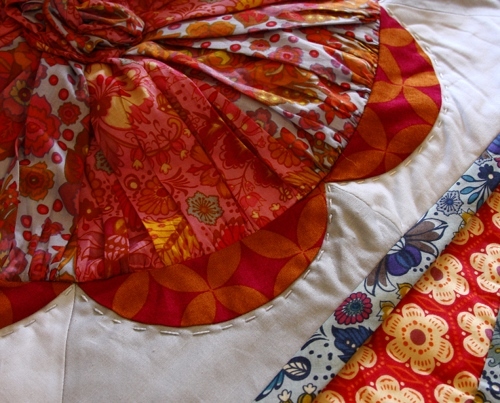 Before I left I had imaginary posts about prom, charity quilting, new studio pics. As I left there were imaginary posts about Roman turning one, stuff I was sewing for market, the process of shipping 2000 lbs to Minnesota, and a few other things that are escaping me now. While I was gone there were imaginary posts about everything we did, said, saw, heard, ate, laughed, hoisted and sang while we were gone. And the cute shoes I was wearing. And all the places Jeff photographed Roman around Minneapolis which are all logged in a phone that he left in a plane. And fun book parties and book signings where there was a drink named after me (quite strong and pink, thank you) and where I signed someone's book Anna Market instead of Anna Maria. There is alot of talk regarding just how much I can juggle between work and family, yet I want to redirect that conversation into how much I cannot write and talk at the same time. Now that we're back posts are mounting on the imaginary blogpostpile about family, Juliana's graduation, wonderful reviews of Handmade Beginnings to point to, lots of market pictures to upload, and there are most certainly people that should be slapped for being so wonderful and nice. I'll get to that eventually. So that is the tippity toppity of the stack and all that I can see in it from where I'm standing down here. Now the task of pulling one thing out at a time without being buried by it all. Oh, I can relate to the stack. Your stack sounds so colorful and wonderful; it will be worth waiting for. Get a step ladder, honey. It'll make things a little easier to get down! bring it on when you can. 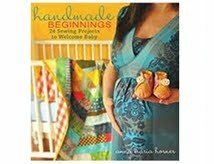 It's great fun to read and I neither sew nor quilt (very well) but have been inspired by you in countless ways. Uggggg I hate when I get overwhelmed. How about this...take one step at a time...a few pics and a paragraph about each topic...one per day! You should be caught up in two weeks!!!!! LOL! Wow! I'll be waiting anxiously to see the great things to come! We had such fun having you at Treadle! Thanks for the great visit! I am sorry to hear about the lost phone, I hope they get it to you. My friend just got back from Market too and is exhausted..I can understand that. I do hope there is some post or pattern for the little bit of quilt you just teased us with. That looks adorable!!!! I know its not in your new book because my sweet husband ordered it for me for Mother's day and I'm sad (and proud) to admit that there are drool marks on just about every page. I will be wearing it out. Can hardly wait for all the gorgeous posts, Anna! So much fun meeting you at Market finally! You are just too sweet, and I consider you a dear friend. I've been enjoying the book tour in your absence (still have my fingers crossed at winning a copy somewhere on blogland). I hope you rest well. Drinking your new drink! What fun. In all the coverage of quilt market, the info on you and your lines was my favorite. It just makes me so happy to see all your fabrics, books and patterns while I toil away here at my dreary job. However, that dreary job just afforded me the ability to purchase a truckload of dobby dots, voile, and good folks, so I guess it's all good! I love the photos I have seen so far of your booth at the market (via the fabric shoppe)! Can't wait to visit you here and see more!!! Congrats on what looked like a wonderful booth and show! I am always in amazed by all you do. Also I have refused to take up quilting do to all my other projects but your quilt around the block and the flower one may just change all that for me!!! Can't wait to hear all the news and I know how bittersweet these next few months are as Ms. Juliana graduates and starts whole new adventure. Ooh - is this picture of a quilt? GORGEOUS!!! I know what you mean about imaginary posts... since starting my blog I think of all happenings as potential blog posts. Good luck unburrying yourself! You're not allowed to post pictures of beautifulness like that without telling us what exactly the amazingness is, and where I can buy the pattern! You crack me up. It was great to see you! Even if for just a snippet. Can't wait to seem more pictures from the Quilt Market. Love those shoes! Don't you just LOVE Alicia Paulson's little dresses!? Love the purple toenails even more than the shoes! Eager to see and feel the new fabric line too! Congrats on a successful Quilt Market. "Do not hurry, but do not rest" as Goethe said. We all love your work and your blog. We can be patient knowing that such yumminess like the one photo in this post is only a sign of things to come. It will be awesome. That 2000 pounds was worth every ounce, your booth was AWESOME! When I got back from Market (Saturday), it was my birthday. I had 12 of my friends at my shop waiting for me to sew the rest of the weekend and celebrate my last birthday in my 20s. When I pulled out all of my purchases from Market, I squeeeeaaaaaled once I got to your book, showing off my autograph and telling everyone that you are Superwoman! It was such a pleasure meeting you, it really made my Market experience complete (which I told you as we stood for a photo!). I haven't gotten to posting any of my photos yet either but I sure can't wait to show them off! I love the whole, Imaginary blogposts concept. I have a running talley of them in my head too! Whenever you get around to making some of them 'real', I'll be here to read them. My oldest is graduating too, I'm overwhelmed at how fast the time went by...and am hugging the others close to my heart! Every subject you listed is one I would not want to miss. But catch your breath, sort it out, and I will be patient. can't wait to see what you have been up to. 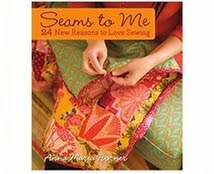 oh yeah, and i finally bought your book seams to me. so exciting. i have been devouring all the info! thanks! I loved your blog, very colorful, it's beautiful! not English, use the google translator, I hope you understand. 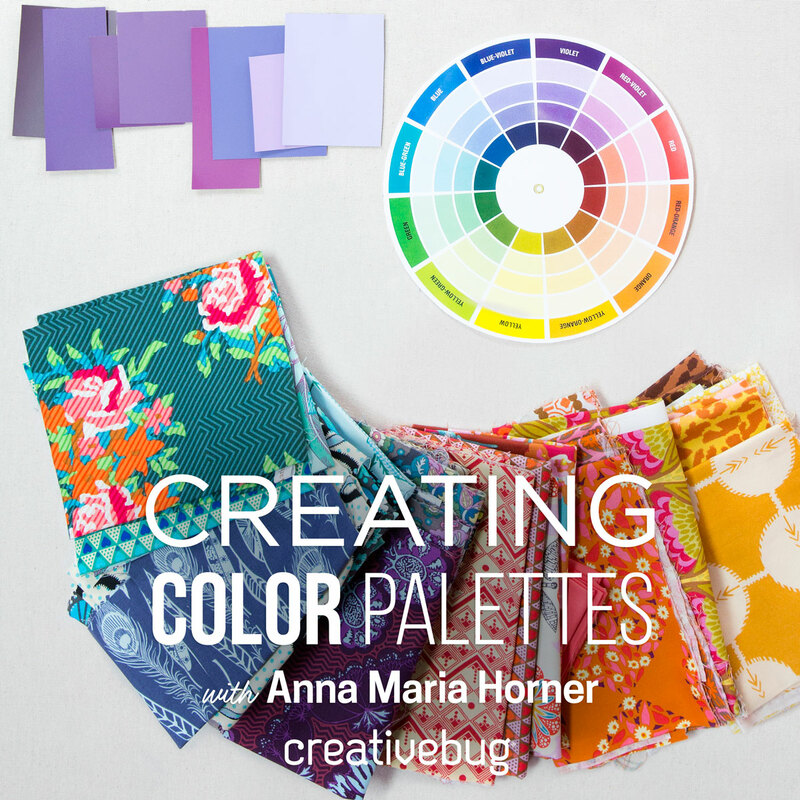 Anna, I just got your beautiful new book! I love it already. I don't have kids yet, but hopefully will soon and can't wait to get started on the beautiful projects you have. I'll definitely be making some for friends this summer! I'm doing my first blog giveaway; a mermaid doll. My sewing skills aren't completely brilliant but I'm getting there! I just finished washing and ironing a half dozen yards or so of Garden Party and wanted to take the time out to tell you how much I appreciate your talents! Carefully ironing each yard one after the other made me appreciate how much thought went into this collection. I tried to imagine whether you used a computer for your designs or painting by hand (or a bit of both?) and what design ideas inspired you (art deco meets country western gal?). I plan to cut my yards up into fat quarters for my first quilting bee with friends at the Orange County Modern Quilt Guild. We will be making improvisational log cabin quilt blocks. I can hardly wait to see how they all come out! I also had the nice treat of being able to read your new book recently and keep glancing at the photos, wondering which project I'll do first (my favorites are the pillow and the Center of Attention Quilt). I hope this note finds you resting and getting lots of R&R, play time with your 6 beautiful children, and some me time before tackling your next project! market is even more packing. I want to see more of that quilt!!!!! You are one busy girl! It sure is better than being bored! Shipping 2000 lbs to Minnesota..I'd love to know about that. I can imagine, with all that's going on!! Imaginary posts.....oh wait, you weren't talking about my blog? I'm pretty sure I blog all day long, but very little of it actually makes it out of my head and into my computer. I think every blogger has a stack of these. Usually I manage to completely forget where I put the stack of post ideas in my brain when I sit down with 5 minutes to actually post. 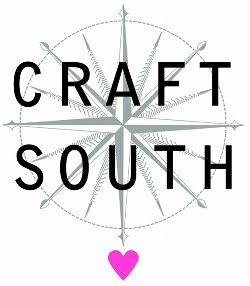 I wish I could have seen quilt market- I've heard amazing things about your booth, and your photos and sense of style are always an incredible inspiration. I'm new to blogging and find myself drafting imaginary posts all the time. I have quite a mental backlog too. I would PLEASE like to see this quilt in it's entirety! I am SO curious!! It looks like one I would like to make and would buy a pattern for.